You’re sitting in a circle surrounded with anywhere from 20 to 30 people. Each person is situated with their own five foot wide space where they have laid out their yoga mat and on top of that, however many pillows and blankets they please. You’re doing the best to get comfortable as you mentally prepare for the next 10 hours ahead of you. None of which will include sleep. You have been fasting all day, and have been advised to follow an essential diet for the past two weeks. And up until you put that cup to your mouth, filled half way with an odd smelling, thick black slush, the scenario looks pretty innocent. The rest of the night you will have completely lost yourself, in the quest of trying to find yourself and trying to heal yourself. Icaros, spiritual traditional songs, also referred to as, “Songs of Heaven,” float through the background, as the shaman occasionally plays a jewharp and some acoustic guitar. You can hear people around you laughing, crying, moving, and some reaching for the buckets that have been placed before them, and with a loud release, purging violently. Purging, because they need to get clean. Purging, for sake of healing. The experience explained above, may, to some, sound like one hell of a gamble. And it is. This black slush is known as Ayahuasca, a sacred plant medicine. The ayahuasca experience is wild ride in which one finds themselves deeply exploring their own minds and the universe we all live in. While it has been primarily a South American indigenous tradition for hundreds, possibly thousands of years, modern day people, like these native New Yorkers, have become curious, and have put their lips to the cup. 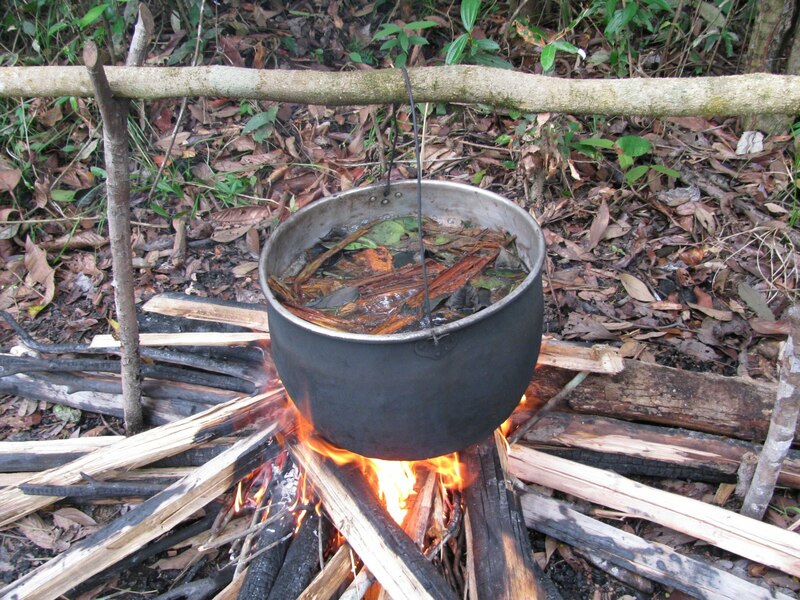 Ayahuasca is a vine that grows deep in the jungles of the Amazon. It is a hallucinogen containing the DMT molecule. While not to undermine any other psychedelics, for all of them are known to help an individual gain an enormous amount of introspection, ayahuasca is particularly unique and stands out due to it’s traditional ceremonial process. Ceremonies are led by shamans or “ayahuasceros” who have worked extensively with the medicine. People gather and sit in a circle as the shaman guides them through their experience by first introducing the medicine and it’s abilities. Andrew Stephen Pratt, a native New Yorker, spent a month in Peru and drank the sacred brew seven times. He explained that he’s heard some people refer to ayahuasca as being “almost like seven years of psychotherapy.” It shows one, and amplifies for them, the reality of their experiences and the emotional implications they carry. 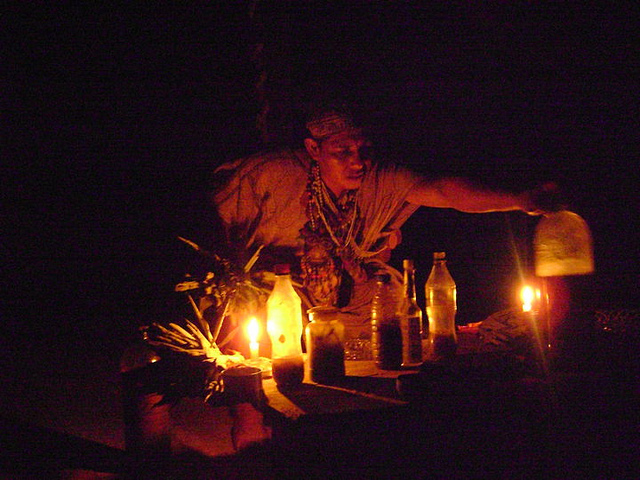 A Shaman at his altar as he prepares for ceremony.PHOTO SOURCE: http://www.flickr.comSome people may not understand how ayahuasca is considered a “medicine” and may be taken aback with the ceremonial process. But what needs to be understood is that “modern day medicine” is really only about a hundred years old. Greg Freeman, also known as underground hip-hop artist Truth Now, adds that, its key to understand that “just because something isn’t in a prescription bottle, doesn’t mean that it’s not medicine.”Because we are “civilized” and live in such an industrialized society, many may not relate or resonate with what ayahausca offers, which is both immense healing and introspection from a sacred plant medicine. Some may not feel it’s relevant to the world, while others would greatly disagree. “Ayahuasca is my greatest teacher, she runs through my veins like my blood,” comments Linda Burroughs. She continues to say that, “ I always felt like when the student is ready, the teacher appears. I feel like the world has become ready for this medicine to reach critical mass. People are needing the medicine to wake up, to get well, to be healed.” Linda Burroughs first drank the brew in Ecuador and has since continued to make visits to South America. In the past few years it has been clear that people are more desiring of alternative healing and are seeking to “go deeper” with their understanding and/or perception of life. This has been seen within the past ten years, with something so simple as fast food restaurants beginning to offer salads on their menus to the growth of people who began to show more interest in things such as yoga and meditation. Known to shake people into an awakening, ayahuasca has the ability to encourage reflection, understanding, as well as offer immense healing on the physical, spiritual, and emotional level. While not everyone may understand the desire to sit in ceremony, and for some who may be uncertain and maybe even fearful, because ayahuasca forces you to see yourself as you truly are, it offers tremendous insight into one’s life and mindset. It may be the honest truth you have been searching for, the thing to “set you free,” or it may just remain something you read about in a magazine and move away from as you flip to the next page..
Charing, Harold G. Preparation For The Ayahausca Experience. Grant, A.. Yoga Teaching Increasingly Popular As Second Career. 26 April 2011. McKenna, Terence K. Food Of The Gods, The Search For The Original Tree Of Knowledge : A Radical History Of Plants, Drugs, And Human Evolution. Bantam, 1993. Pinchbeck, Daniel. Breaking Open The Head: A Psychedelic Journey Into the Heart of Contemporary Shamanism. 2003. Strassman, Rick. DMT, The Spirit Molecule : A Doctor’s Revolutionary Research Into The Biology Of Near-death And Mystical Experiences. Park Street Press, 2001. A BIG THANKS to all interviewee’s: Linda Burroughs, Mason Lacas, and Andrew Stephen Pratt, as well as to, James Riverstone, for his powerful knowledge and insight.